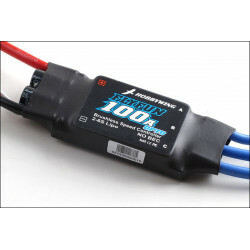 Hobbywing Platinum 100A V3 HV ESC Speed ControllerFeaturesHigh-performance microprocessor with the o..
DYS BL20A BLHeli Multirotor 2-4S Ultra Light E.S.C. Speed ControllerThese ESCs are designed sp.. The UBEC is an external switching mode DC-DC regulator; it draws the DC voltage from 2-6S Lipo battery, drops it to a voltage level that is suitable for receivers and other electronic devices, and keep providing the stable current output up to 10Amp. As the UBEC has such a powerful output capability, so it is particularly applicable for large helicopters and fixed-wing aircraft. options for the output voltage, applicable for all kinds of receivers/gyros/servos, etc. It has BEC shoot-through protection, which prevents the input voltage from directly flowing to the output end and causing damages to receivers, servos and other electronic devices connected. It features other protections like over-current protection, short-circuit protection (at the output end) and thermal protection to make the units use more safe and reliable. Two cables are connected in parallel at the output end of the UBEC, allow larger current to flow into the receiver. It has one status LED, which lights up when the output voltage is within the normal range. The external switch can turn on/off the UBEC easily. The aluminum case is helpful for heat dissipation & EMI (Electromagnetic Interference) reduction. 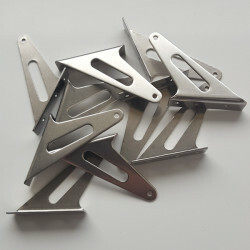 Pack of 10 Stainless Steel control horns.Weight - 2gBase Dimensions-Width - 10mmLength - 31mmBase ha..